Ads highlight why you should watch movies from the beginning. In days gone by, if you missed the start of a film on TV then that was it, you just had to sit through the rest and figure it out as you went along. It was a confusing way to watch films, and could often change the meaning of the story. To highlight the importance of catching films from the beginning, Sky has launched a new set of typography-based ads, in a campaign called 'Miss the Start. Miss the Story’. Created for Sky by Serviceplan Campaign X to promote how users can now restart films on linear TV with Sky, these clever poster designs target the German market, where viewers still predominantly watch films when they're on, as opposed to through On Demand services. To point out why it's important to catch all of a film, including the beginning, these ads delete the first letters from familiar titles that rely on eye-catching and recognisable typography. 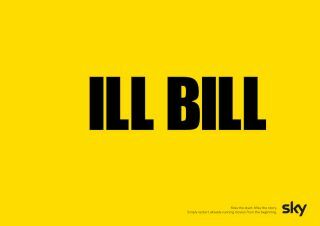 Take the martial arts classic Kill Bill, which becomes the slightly less impressive Ill Bill when you chop off the K (see above). It's a simple but effective trick that plays with viewer's expectations and invites them to engage with the ads. The posters also underline how effective the right combination of typography and colour can be. Check out the rest of the campaign ads below. They can take the first letter of our movie, but they can never take our freedom!